maybe I should take a bit of time to mention some of them. Ghana Voices, which part of the Writers Project of Ghana , featured prize-winning author Elizabeth-Irene Baitie reading from her latest novel for teens, The twelfth heart, a boarding school based story. This was the evening that Accra suffered floods, so the audience wasn’t as large as expected, but Baitie is not only a good reader, but enthusiastic about both her writing, and her professional work. I already had a copy of the book, so at least I managed to get the author’s autograph, plus it has moved from a TBR shelf to my desk, which is definitely up on my priority list. 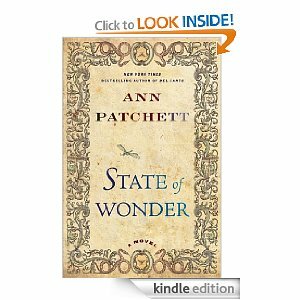 State of wonder, which interesting enough I think we all read on Kindles! Although we were all somewhat critical of certain aspects of the book, that didn’t detract from its being a good choice for a book discussion. Our next discussion will be Hilary Mantel’s Wolf Hall, so I’ve started that – again on my Kindle. which upset me was the fact that twenty-seven people had signed up to attend, but only ten actually came! find the variety I was looking for. I wasn’t happy. of interaction between friends and colleagues, though as usual there were many issues left unresolved. Now I have to catch up with work! 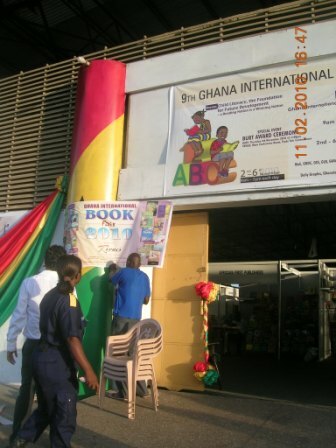 I did go to the biennial (and yes I do mean every two years) Ghana International Book Fair, and I did go twice, as I originally guessed/suspected. There didn’t seem to be quite as many stands as on some previous years, but generally it seemed better organised. There were quite a few events taking place during the week – some workshops for publishers, writers, poets, plus some book launches as well as gatherings for children. I went to one book launch – of some Senior High School textbooks for Core Maths and Core English – held at British Council, mainly because of an email invitation from the Ghana Library Association. The brochure for the Fair wasn’t badly done, and had contact details for exhibitors, which is useful in the future. For me personally there wasn’t that much I was interested in – the big market is of course the educational one – and for general reading many of the exhibitors had books suitable for primary age children. Otherwise the selection seems to be aimed at the academic market, so I did pick up a few things for work, and met a colleague who was doing the same! The kids did buy some second hand “trashy” novels (I wonder why not more of these second hand sellers were around – I guess they figure they don’t need to bring attention to themselves? or it is is too expensive to exhibit?). And I bought a couple more African Writers Series books, plus some Nigerian plays which I have heard of, but I am ashamed to say I have never read. Not sure how these two ends of the market – which are mostly education oriented are going to make a reading nation, but still I suppose it is a start.